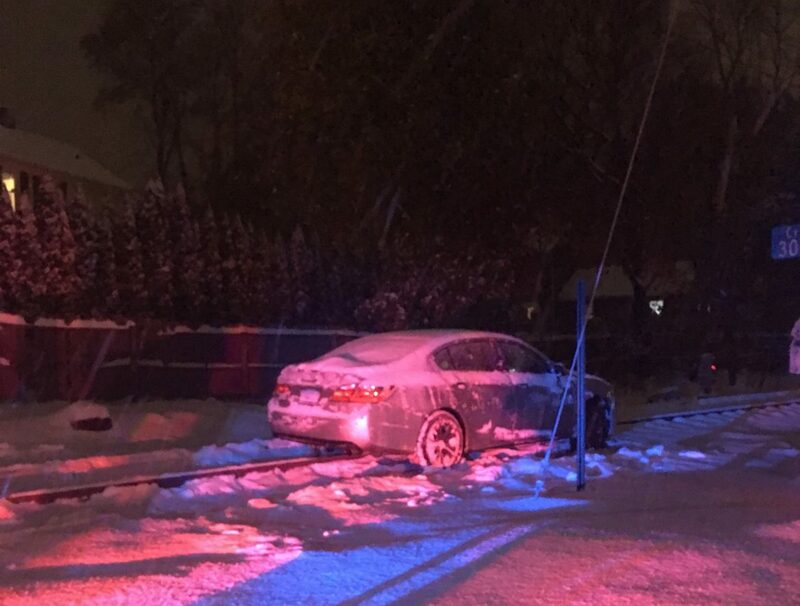 A motorist during Thursday’s snowstorm pulled off of Richmond Hill and onto the train tracks toward Grove Street, officials say. The driver, a man, traveled about 20 to 30 feet before his car came to a stop on the tracks, according to firefighters on scene. Metro-North Railroad has been forced to halt trains at Talmadge Hill Station and now must remove the vehicle from the tracks and then inspect the tracks and switches to ensure they’re safe, officials say. Though Metro-North is reporting a 10- to 15-minute delay “due to slip and slide conditions,” there’s no information on the railroad’s website or Twitter account about the rogue motorist. It wasn’t immediately clear why the man turned onto the tracks or whether he’ll be cited for motor vehicle violations for doing so. Firefighters on scene said the man may have lost momentum while traveling up Richmond Hill in the slippery conditions and turned hard right onto the tracks thinking it was a road. NewCanaanite.com will have more information once it’s available.